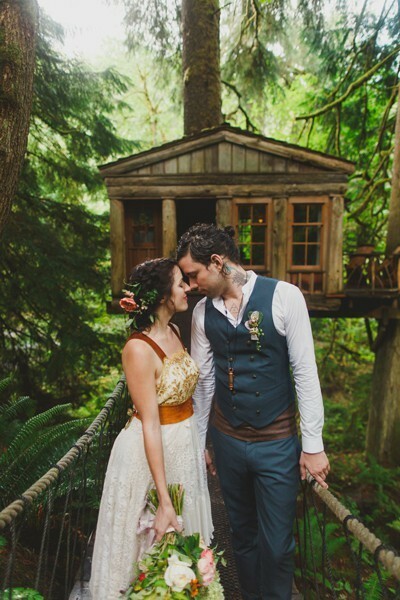 Katie Daisy and Elijah Goodall's treehouse wedding. Something borrowed. Something blue. Wear white. Cut off the drunk best-man speech. Throw the bouquet, toss the garter. These are all things that have come to be expected at every wedding. Who says it has to be done this way or that way? What about the couple's way? Some couples have pressure from their families to marry in a church or to wed in the same venue as their parents. It doesn't have to be like that. A wedding is a celebration of love and a commitment officiated before a group of relatives and friends, plus a little bit of paperwork. That pretty much sums up the requirements of a legal wedding: Love. Witnesses. Legal forms. Wedding officiate. Those are le-must-haves. Everything else is optional. Two Central Oregon couples who chose to celebrate their respective wedding days in their own way are proof of that. Katie Daisy remembers seeing a photo of what she describes to be, "the most magical treehouse nestled in the pines." When she and Elijah Goodall began to plan their special day, Katie began doing research on the earthy location and the idea of having a treehouse wedding. When it started to become more of a doable reality they jumped at the chance. "It was a no-brainer for us that our small wedding would be held in the trees," says Daisy. The ceremony itself took place below the treehouse, where moss clung to tall branches while ferns, rooted in the ground created a path of natural direction. The guest list was an intimate number and when rain made a tardy RSVP, Daisy claims that it only made the ceremony, "even more beautiful." This is what they wanted, this is what they had planned for and their wedding was, in a sense, them. What made Katie and Elijah's day so special is that it is what they wanted. It was the first dates, the late nights talking, the first kisses, the first feelings of falling in love and the daily work they both put in to make their union theirs. Amy Mitchell and Henry Abel had almost that exact same wedding, except it was completely different. Neither bride nor groom wanted an elaborate wedding. "I wanted to elope, but Amy didn't want to get married at City Hall and neither of us [were] looking for a wedding at a church," says Henry. After 12 years together, this is a couple who knows what works for them. 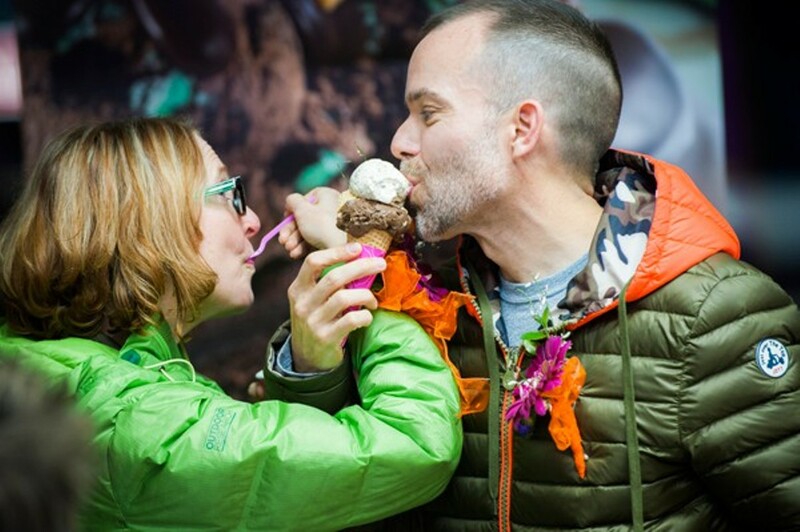 Date night at Baskin-Robbins had become something of a norm for the pair and what started off as a joke began to really make sense to them: Have their wedding at the very place where they began to fall in love, Baskin-Robbins. It made sense to them and that's all they needed. The couple wanted it to be a surprise for the guests, who thought they were along for dessert, but it turned out they were to be a part of something much sweeter, a pop-up wedding.